Some people celebrate Valentine’s Day with their partner, some spend it with family, and some spend it with a group of dear friends! If you’re planning to gather with a group of loved ones on Thursday, it’s good to have a few recipes on hand that you and your friends can enjoy together. 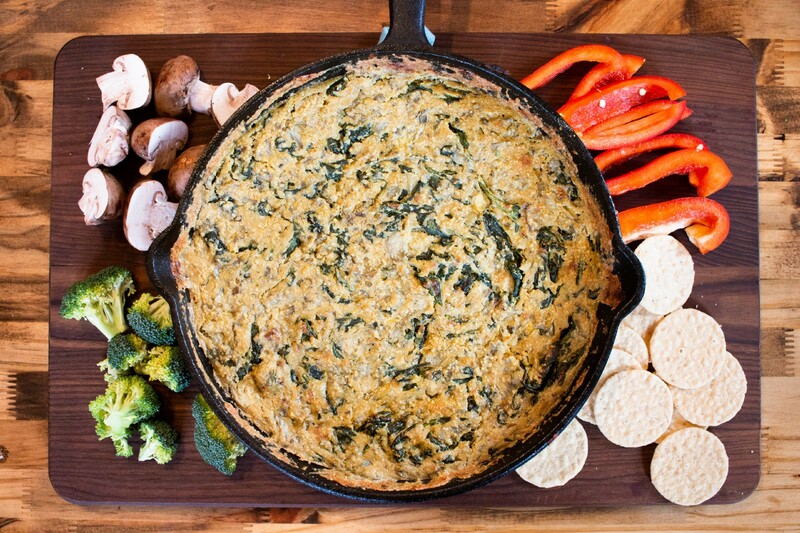 We’ve put our own CBD Superfood twist on this vegan Spinach & Artichoke Dip by Minimalist Baker to offer you a recipe that will feed and please everyone! Made from a cashew cream and nutritional yeast base, this dip is free of dairy and easy to digest — but it is rich with garlicy, cheesy flavor! We’ve also paired it with gluten-free dippers to add another dietary accommodation to the mix. Dip in and soak up the love of your community! Soak cashews for 1 hour in very hot water uncovered or in cool water overnight. Then drain and set aside. Heat a large oven-safe cast-iron skillet over medium heat. Once hot, add oil, garlic, and shallot. Sauté for 1–2 minutes. Then lower heat to medium/low and sauté for 2–3 minutes more or until just golden brown and slightly caramelized. Remove from heat to cool. Once cashews are soaked and drained, preheat oven to 375˚F. In a blender, mix soaked and drained cashews, half of the sautéed garlic and shallot, almond milk, nutritional yeast, sea salt, and pepper and blend into a creamy purée, scraping down sides as needed. Blend until smooth. Heat the skillet with the remaining shallot and garlic over medium-high heat and add spinach and chopped artichokes. Season with a pinch of salt and pepper and sauté for 4–5 minutes, stirring frequently, to wilt and soften spinach. Turn heat off and add all of the sauce. Stir to combine. Sprinkle the top with additional nutritional yeast. Bake for about 5–8 minutes or until the dip is hot enough to serve. Be careful not to over-bake or the cheese sauce can begin to dry out and lose its creamy texture. Remove heat and brush top of dip with 2–3 tbsp CBD Superfood Coconut Oil. The CBD Coconut Oil should not be cooked because it can lose some of its amazing possible benefits, so adding it at the end will retain the full possible benefits in your artichoke dip. Serve hot and dip in!